Commercial spaces can have complex considerations for dividing up the area’s between the common areas, areas belonging to the building owner, and area’s leased to tenants. How many square feet is your project? As simple question you say, it’s AxB=C and other geometry equations we all learned in the 4th grade. But what if your project is going to be leased out? Or owned as condos, but have common spaces? Do elevators count? Commercial spaces can have complex considerations for dividing up the area’s between the common areas, areas belonging to the building owner, and area’s leased to tenants. Thankfully there is BOMA – Building Owner & Manager Association – to set a standard to follow. I’m going to go over the types of building areas and some tips on how to measure them using AutoCAD. In general Area counts can go on a separate layer they you can freeze and turn off when not needed. Use an obnoxious color you can’t miss, so you can remember what they are for, and in AutoCAD set it so it is a “Non Printing Layer” in the layers options. This is your overall building size following the exterior perimeter of the building following the outer finish. This is used by building codes and authorities to establish your buildings’ square footage. 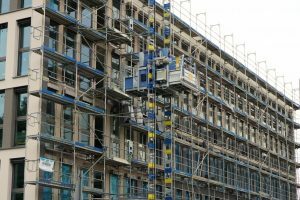 If you are going to rent the building in whole, you could use this measurement, especially if the lease allows modifications to the building exterior, and the renter is responsible for all exterior maintenance. If however, the landlord is covering the maintenance and exterior of the building you would look at shell and core square footage. If the lessee is only responsible for the area inside the building, the gross square footage is measured differently. The lessee area is measured up to the exterior wall, and halfway through windows that make up more than 50% of a room’s wall area. If there is a common area, elevator or other shaft the lease line would end at the exterior of the walls surrounding those areas. If there is another tenant the demising wall each share the wall equally. A way of figuring this out in CAD is to use a polyline and the “in-between” snaps. Start at a corner and follow the lease area as above. You can use the “in-between” snaps to get between the inside and outside of window openings, wall intersections and other areas. Always make sure to use the “close” command to make it a full polyline object. Using properties one can get an exact area take off. To get the landlord’s area you must be a little tricky. Start the poly line on the outside corner and follow the perimeter, but when you get back to the start point stop short so it doesn’t automatically close, go to the inside edge of the lease polyline. Follow it back along that line to the start point. Close the polyline as normal then zoom in on the part where you stopped short, edit the polyline so you can move that point back to the “start” area. The polyline object is a big “C” shape essentially. This polyline will now give you the total area of the building’s shell. Net square footage is the area of the space minus the walls, columns, chases and shafts that go through the space. Think of it as the area of the carpet. This has couple of ways of being measured in CAD too. Start on an inside corner and measure around as above, but at doorways go halfway between the walls. To deduct columns and other objects in the middle of the space, drop the polyline down to the center of the column (Good old “midpoint” snap and “O-tracking”) follow around the object back to where the line dropped down, place a point there and continue back up to where you dropped down, and continue around the space. Another useful tool is “Bpoly” command in AutoCAD that will drop a polyline into an enclosed space – like the “Hatch” command can cover an area. However – there is some planning involved. To get columns and other objects included correctly draw a line that connects them to a wall. Lines between doors must made to enclose the room, and other objects like text, hatches, leaders must be turned off (freezing is probably better though). When all of your objects are linked you can drop the “Bpoly” command, then erase your guides. This may take some trial and error to get it right, but it can be very handy to do take-offs very quickly. Definitely pick up the BOMA standards guide and review it, it is a great resource and you can help your commercial clients make sure they are renting and leasing the correct amounts of space.